New Jersey Motorcycle Accident Attorney | Tomes & Hanratty P.C. New Jersey is a diverse state with a wide variety of sites to enjoy and roads to experience. Motorcyclists from all over the country come to New Jersey to enjoy mountain roads, pristine farmlands, and bustling beach communities. Though New Jersey is known for congestion and some unsightly roadways, many bikers know where to find truly beautiful terrain and communities. Motorcycles have become a popular past time for many in the state. As the population of biker rises, so does the chance for accidents. Motorcycles are fast and hard to see. When a motorcyclist is involved in a motor vehicle accident, they are in grave danger because of the lack of protection. Unfortunately, the number of injuries and deaths resulting from motorcycle accidents is on the rise. If you were involved in a motorcycle accident caused by another driver’s neglect, you should contact Tomes & Hanratty, P.C. to discuss your legal matter and receive quality legal support. Many motor vehicles operators pay for no-fault insurance in New Jersey. No-fault insurance, also known as personal injury protection (PIP) will cover the medical bills and lost income directly after an accident regardless of fault. In New Jersey, most insurance companies do not provide PIP insurance to motorcyclists or their passengers. This means that if you were injured on your motorcycle and need medical attention, you may need to take legal action against a negligent driver to cover those financial burdens. 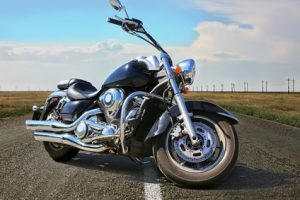 When a biker is injured in New Jersey in an auto accident, they may be limited in their ability to sue for damages because they are subject to something called the “verbal threshold”. The injured party must prove serious and permanent injury before becoming eligible for damages. If you are successful, you may be entitled to compensation to cover medical bills, lost wages, legal fees and pain and suffering. It is important to note that the statute of limitations on motorcycle accident lawsuits is 2 years from the date of the incident. Motorcycle accidents can result is very serious injuries. It is important to consider your legal options when in a motorcycle accident. Because you are usually not provided PIP coverage after an accident, you may be immediately impacted financially. It is important to retain the services of an experienced law firm to protect your rights and future. Tomes & Hanratty, P.C. has been a legal resource for the people of New Jersey for over 30 years. If you need our quality legal services, contact our office for a consultation today. If you are unable to meet us because of your injuries, we can meet you at your convenience.